This morning, Facebook announced that they will begin rolling out new requirements for its “Custom Audiences” targeting tool for advertisers. These updates are a useful step towards creating better user understanding of data flows both on Facebook and in the broader web, and enhancing the accountability of advertisers who use custom marketing lists. Facebook’s Custom Audiences is a tool that allows advertisers to upload their own marketing lists of users’ contact information — typically, email addresses or phone numbers — and to target advertisements to those same users on Facebook. In order to protect privacy, the uploaded list is first “hashed” or encrypted (Facebook supports SHA 256). The platform then compares the advertisers’ encrypted data with its own encrypted data from users’ profiles to see who can be added to the advertiser’s “audience.” This is done without the advertiser knowing which users from their own list were a “match,” or whether they even have Facebook profiles. Instead, advertisers receive a report from Facebook with a rough estimate of how many people they are reaching. For Facebook users, clicking “Why Am I Seeing This Ad?” at the top of an advertisement results in a pop-up that provides more information about how an ad was targeted. For example, the disclosure may say that the user was targeted based on his or her “Interests,” which are informed by activities such as liking certain pages on Facebook. It may also provide other information about parameters used, such as age or geographical location. With the upcoming new requirements (described below), it will now also provide information about the source of the information, and a disclosure if the advertiser was able to reach them through their phone number or email address. What’s new for advertisers and Facebook users? 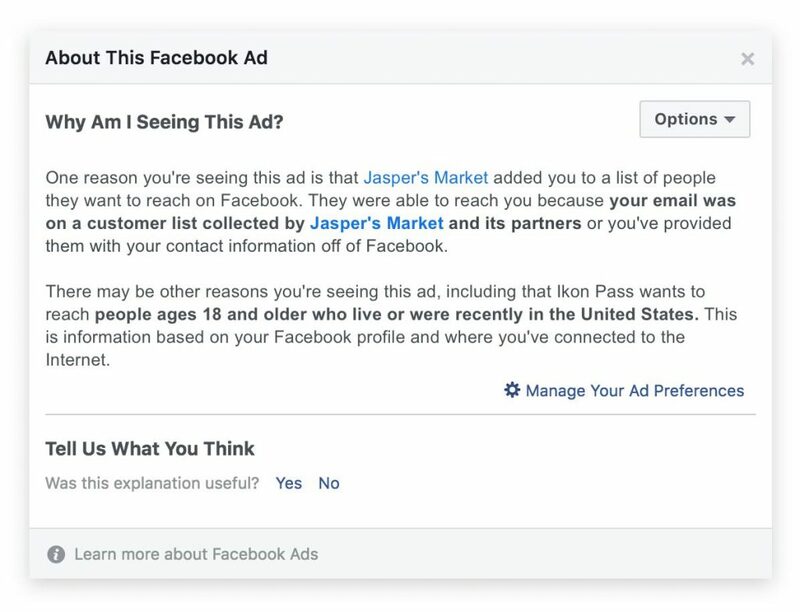 Following todays’ updates, when an advertiser uploads a customer file to create an advertising “audience,” Facebook will now require them to state if they got their information (1) directly from people, (2) from data partners, or (3) a combination of both. When users click “Why Am I Seeing This Ad?”, they will now see this information, along with a disclosure if an advertiser used their email address or phone number in order to target the ad. As before, users can subsequently choose to stop seeing ads from that particular advertiser, or manage their preferences for targeted ads in Ad Preferences. Advertisers can obtain marketing lists from many different sources, including from their own customers (for example, through loyalty cards, newsletters, or email subscription lists). They might also be working with a Customer Relationship Management (CRM) system, such as Salesforce, that helps handle data about clients, customers, or prospective customers. In addition, many advertisers obtain customized lists of “audiences” from online behavioral targeting and marketing companies, such as Acxiom, Experian, or Oracle Data Cloud. For example, as we described in a 2015 cross-device tracking report, Oracle’s BlueKai links 80+ sources of data to “audience categories” based on purchasing intents—e.g. “Back to School Shopper” or “Graduation Gift Buyer.” Although Facebook is winding down its direct integration with these third-party data providers, it remains a common industry practice for advertisers to obtain marketing lists from third-party providers and use them elsewhere (subject to contractual limits). According to Facebook’s Custom Audiences Terms of Service, it is the advertisers that are ultimately responsible for having permission to share and use the data they hold. Advertisers must promise that their data was obtained legally and appropriately — for example, they must promise to adequately encrypt the data, and to honor any users’ Opt Outs that they have committed to honoring. According to Facebook, advertisers will also now start seeing more regular, detailed reminders of these obligations to help protect users’ privacy. Transparency in online advertising–i.e. showing users who placed an ad, and what kind of information was used to inform the placement of the ad– is challenging even in a controlled environment like Facebook. In the broader web, mobile apps, and Smart TVs, it becomes even more challenging, because the infrastructure and protocols must exist for hundreds or thousands of advertising platforms to communicate with users through consistent tools. In the online environment, the most common method of providing transparency around personalized (behavioral) online advertisements is the Digital Advertising Alliance’s AdChoices icon and opt-out tool. Developed as a self-regulatory program for online advertising, it provides a way for advertisers to share information about data that is being collected about their customers while providing users with a centralized tool to opt out of seeing such ads. The system isn’t perfect–for example, most users do not recognize the icon, and different ad networks may provide different amounts of information, from fairly detailed (“this ad is based on your general location and the time of day”), to very broad (“this ad is based on “information about your online activities”). Most advertisers have to strike a balance–too broad and the information is not useful, but too detailed, and it may become confusing or inaccessible. Last month, researchers at the Harvard Business School explored ways in which greater transparency may even lead to lowered ad effectiveness, if users are surprised by unexpected information flows. We applaud Facebook’s efforts towards building the necessary infrastructure for robust advertising transparency. Will Facebook users click through to view the new disclosures in targeted advertisements? If so, what will their reactions be? Much of the benefit depends on how the platform raises awareness about the new disclosures, and whether the disclosures are tied to meaningful user choices to better control their data. Following months of news about data privacy and the influence of platforms that enable personalized content, we have seen an enhanced focus on transparency and better understanding of online data flows. Better User Education. For users who might not have known that they could be reached using their email addresses or phone numbers, these new requirements are an opportunity for Facebook users to become more aware of online data flows. More Robust User Controls. Transparency through privacy disclosures is primarily useful when it provides users with accessible tools to control the use of their data. We look forward to seeing not only Facebook but the broader ecosystem of online advertisers continue to improve and iterate on user Opt Outs and controls. Political Advertisements and Self-Regulation. In the last year, there has been a growing awareness of the specific role of targeted political content in shaping political views. The Honest Ads Act, introduced in 2017, aimed to address these issues by requiring those who purchase and publish such ads to disclose information about the advertisements to the public. Self-regulatory efforts have also emerged, with the Digital Advertising Alliance recently launching an industry-wide initiative to label political ads. Facebook also recently began requiring political advertisers to verify their identity and location for election-related and political issue ads, and making this information available to users with clear labels. The effectiveness of these efforts will help inform efforts around broader advertising transparency. We look forward to continuing to engage with industry, academics, and advocates on these issues to work towards better consumer education and controls for online advertising. * Stacey Gray is a Policy Counsel at the Future of Privacy Forum, specializing in Internet of Things, Ad Tech, and geo-location data privacy issues. Gargi Sen is a Legal Fellow at the Future of Privacy Forum, with 10+ years of experience in technology contracts, compliance, and risk assessments. 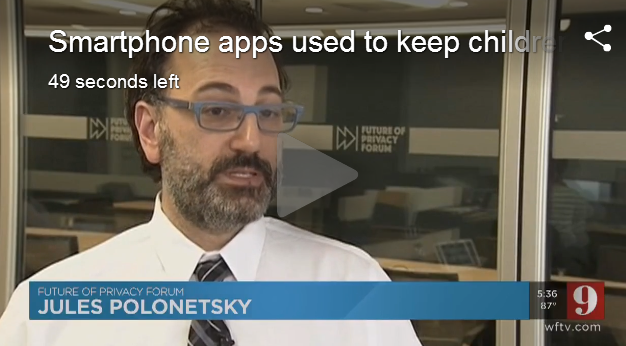 Facebook, Acxiom, and Salesforce are supporters of the Future of Privacy Forum. Thanks to Facebook for their proactive engagement with the privacy community on these updates.